The scientific community quickly rejected Taylor's theory on mountain building. The idea of continents being able to move through a solid Earth seemed so far fetched that few serious geologists would accept it. That did not stop everyone from thinking about the idea, however. In the early 1900s, a German scientist named Alfred Wegener picked up on the concept and, before he was through, made many geologists think that the impossible might be possible. Observatory, where he experimented with using kites and balloons to take high-altitude weather readings. Wegener was quickly making a name for himself as a meteorologist when, in 1906, he was invited to join a Danish expedition to study the climate of Greenland. For almost two years, he took detailed atmospheric readings of Greenland's severe weather patterns and perfected the use of tethered balloons. In 1908, he returned to Germany where he was offered a position at the University of Marburg, where he lectured on meteorology and astronomy. Wegener had a special ability to explain difficult topics in simple terms. He also stressed the importance of using data from other areas of science to help show how a topic fit into the "bigger picture." While Wegener was working at Marburg, he became interested in the idea of continental drift. It is not known if he actually read the work of either Taylor or Snider-Pellegrini, but like the other scientists before him, he was fascinated with how the continents across the Atlantic Ocean seemed to fit together. In 1911, after reading a report about the similarity of fossils found in both Brazil and Africa, he became convinced that the continents had split apart long ago and "drifted" into their present positions. Wegener searched the literature for other geological reports and began collecting data supporting the idea. In January 1912, he presented his hypothesis at a meeting of the Geological Association in Frankfurt. The members of the group did not quite know what to make of this "weatherman" who was lecturing them on the topic of rocks. Before he could pursue the theory further, Wegener joined another expedition to Greenland. While conducting his experiments, he faced many challenges, often spending days at a time camped out on the frozen ice. On more than on occasion, he cheated death. Once, he narrowly missed getting killed by falling ice when a glacier he was climbing on started to break up. 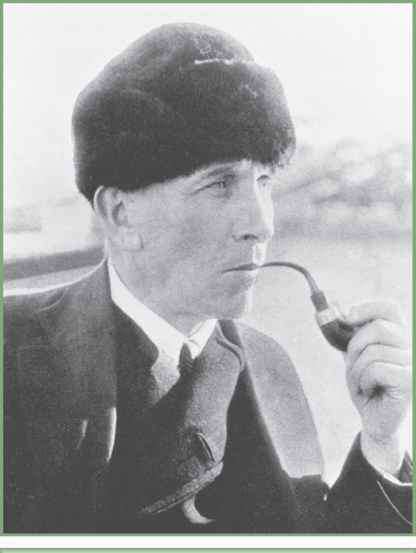 Figure 2.5 Alfred Wegener (1880-1930) filled in many gaps in the early continental drift theory, leading the way to the currently accepted theory of plate tectonics. Unlike Taylor, Dana, and Suess, Wegener presented an enormous amount of data from other areas of science to support his theory. In the final edition of The Origins of Continents and Oceans, Wegener wrote the following: "Scientists still do not appear to understand sufficiently that all Earth sciences must contribute evidence toward unveiling the state of our planet in earlier times, and the truth of the matter can only be reached by combining all this evidence." This idea became known as the "interdisciplinary approach" and was very different from the way that most scientists went about their business. When it came to the Earth sciences, most scientists just worked in their own fields. Mineralogists studied minerals, paleontologists studied fossils, and meteorologists were just supposed to study weather. Wegener was different. 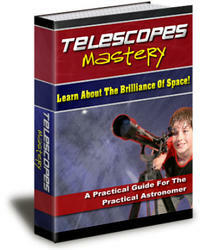 He had a gift for seeing the "big picture" and was not afraid to work outside his field of expertise. 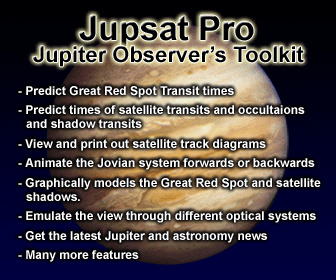 Perhaps the fact that he was trained as an astronomer but spent most of his professional career working as a meteorologist gave him the confidence to "cross over" and use data from other scientific disciplines. As you might expect, the fact that he was a "weatherman doing geology" caused him a great many problems. Because his research and ideas were sound, however, he never backed down from other scientists who attacked his credentials. Today, his interdisciplinary approach is considered an acceptable way for a scientist to operate. Kontinente und Ozeane, which translates in English to The Origins of Continents and Oceans. War I finally ended in 1918, Wegener went to work at the German Marine Laboratory in Hamburg. There, he collected additional data to support his theory. He published revised editions of his book in both 1920 and 1922. The last edition was translated into several languages, including English, French, Spanish, and Russian. Once scientists outside Germany had the opportunity to read his ideas, things became very interesting indeed. Wegener began his argument for continental drift with some simple physics. He wanted to prove that it would be impossible for continental landmasses simply to sink into the Earth to produce the oceans. Suess and others used the idea of a cooling, contracting Earth to explain how "land bridges" sank into the inner part of the planet to form the oceans. Using geological maps, Wegener showed that most of the rocks that made up the continents were made of granite, while those that made up the ocean floor were made of basalt. Granites are much less dense than basalts. Density is a property of matter that helps to control how things float. Objects with a low density naturally float, while objects with a high density naturally sink. We-gener argued that it would have been impossible for the less-dense continental rocks to sink through the much denser rocks under the oceans. To back this up, he used observations that he had made in Greenland. For example, he pointed out, icebergs float on the ocean because solid ice is less dense than liquid water. He suggested that the continents are really just "floating" on the denser rocks found underneath them. 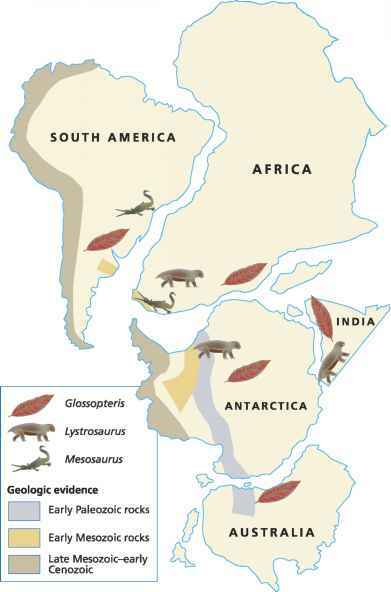 Figure 2.6 The idea of continental drift is supported by the continuation of land forms, fossils, and rocks across continental boundaries. and down, then they should also be able to move from side to side, too. 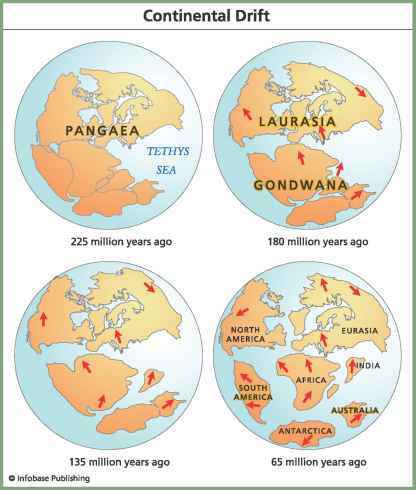 Figure 2.7 As time went on, the continents drifted apart, starting 225 million years ago when the supercontinent Pangaea (the name given by Alfred Wegener) broke up into continents. could be fit back together again to make one large landmass. He called this single continent Pangaea, a word from the Greek language that means "all lands." Next, Wegener outlined all the different types of data that he had assembled to prove that the continents had once been joined together. He started by showing how some mountain ranges would seem to cross over continental boundaries and continue on the other side. One such connection was between the Appalachian Mountains of North America and the Highlands in Scotland. He also showed that, in many cases, distinctive rock types and fossils found on one continent exactly matched those found on the opposite continent. To emphasize these connections, Wegener offered the following example: "It is just as if we were to refit the torn pieces of a newspaper by matching their edges and then check whether the lines of print ran smoothly across. If they do, there is nothing left but to conclude that the pieces were in fact joined in this way." Some of Wegener's best evidence for the drifting of continents came from his work on climates. In many cases, he found situations where fossils and rock types did not match the climate of the present-day continents. For example, many fossils found on the island of Spitsbergen, located in the Arctic Ocean, were of animals and plants that could only have lived in a tropical environment. If Spitsbergen had not "drifted" into its present position, then how could it have had a tropical climate in the past? Another example came from the Sahara Desert, where there are sedimentary deposits called "tillites." These distinctive features are deposited by moving glaciers, the same type that Wegener studied in Greenland. Even the most skeptical geologist would have a hard time explaining how glacial deposits wound up in a desert located in the tropics. After he presented all of the evidence supporting the idea that the continents had been joined in the past, Wegener offered the following conclusions: About 200 million years ago, the supercontinent Pangaea began to break up into smaller continents. As the continents began to drift apart, the Atlantic and Indian oceans started to form. Mountain ranges like the Himalayas and the Alps formed as a result of one continent crashing into another and causing their rocks to be pushed up into mountain ranges. Unfortunately, despite all his excellent evidence, the one thing Wegener didn't offer was a good explanation for how and why the continents moved. This would open the door for his many critics, who were just waiting to attack the "weatherman" who dared to do geology. To say that Wegener's theory was not entirely accepted would be a gross understatement. After the different translations of the third edition of his book came out in 1922, scientists all over the world lined up to take shots at him. In many cases, the simple fact that he was not a geologist was enough to set people against him. Many scientists felt that a man who had no real training in geology had no business writing about the subject. Some of them simply refused even to read his work. They were incensed that this "weatherman" would dare to lecture them on something as critical as the origins of the continents and oceans. Many of those who read the theory were troubled by his explanation of how the continents moved. Basically, what Wegener suggested was that the solid continents moved through the solid ocean crust without disturbing it in any way. This would be like a boat moving through water without leaving any wake behind it. Based on the evidence, this did not appear to be the case. Another problem was that Wegener conveniently left out the data that did not appear to support a match between continents. This raised the suspicions of many scientists who wondered what else he may have left out of his book. Another problem that hurt Wegener's theory was the fact that some of his data were flat out wrong. For example, he predicted that the Atlantic Ocean was growing by over 98.4 inches (250 cm) per year and that Greenland had broken away from the rest of Scandinavia less than 100,000 years ago. These numbers were looked at as being impossibly high because they were just that. Perhaps the biggest problem was Wegener's explanation for the forces that caused the continents to move. The best idea that he could come up with involved a combination of tides and centrifugal force created by the spin of the Earth. To geologists (and the rest of the scientific community), this did not make any sense. Neither of these forces was strong enough to move anything as big and massive as a continent. Wegener knew it was a problem and he tried to hedge. In the final edition of his book, he wrote: "It is probable that the complete solution of the problem of the forces will be a long time coming." About this issue, he was correct! Despite his critics, Wegener passionately defended his theory. He tried to get a professorship at a university in Germany so that he could continue his research. He was repeatedly turned down for the job, in part because of all the controversy he had caused. Finally, in 1924, the University of Graz in Austria offered him a position to teach meteorology. Even though his continental drift theory was unpopular, his reputation as a meteorologist was still outstanding. While at Graz, Wegener continued to gather evidence for his theory and, in 1929, published the fourth and final edition of his book. In it, he tried to answer many of his critics. Sadly, it would be the last time he would be able to defend his theory for himself. In the spring of 1930, Wegener launched another expedition to Greenland, in part to get better data on how fast the island was drifting. When he arrived in Greenland, he found that weather conditions were terrible. Extreme cold and frequent storms caused many delays. Several team members had set up an inland weather station that was in desperate need of supplies. Rather than having someone else do the job, Wegener led the supply team himself. For five weeks, they trekked across the frozen ice, enduring temperatures that reached 54 degrees below zero (-48° C). Wegener finally reached the camp with the supplies, but rather than spending a few days to rest, he decided to return to the base camp on the coast to resume his research. Wegener left with his guide on November 1, 1930, which happened to be his 50th birthday. It was the last time the two men were ever seen alive. On May 12, 1931, a search team found Wegener's body wrapped in his sleeping bag, buried in the snow in between two skis that were standing straight up. Rather than remove the body, the team built an ice structure around it as a monument to the polar explorer and father of the theory of continental drift. While it is unfortunate that Wegener never lived to see his ideas accepted, he probably would have been pleased with the final outcome. As it turned out, not every scientist dismissed his ideas. Even before he died, new discoveries in science were unlocking other pieces of the puzzle. Even though the idea of continental drift initially left way too many unanswered questions, without Wegener's work, the theory of plate tectonics might never have become a reality. How could the fossil naturally located wegener? Who came up with continental drift theory? What did alfred wegener study? What was the name of the scientist that took wegener theory further?